For most people across the world, the closest they get to a chipmunk is watching the animated television series "Alvin and the Chipmunks" that began in the fifties, and has since spawned two hit movies with a third on the way. New Englanders are luckier however, as all but one of the twenty-five species of chipmunk is found in North America (the twenty-fifth, Tamias sibiricus, being found in Asia). The Eastern Chipmunk (Tamias striatus) is spread throughout all six New England states. 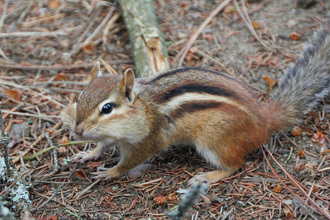 The Eastern Chipmunk has reddish-brown fur with a white underbelly. It has two white stripes bordered by black on its sides and one black stripe on the center of its back. It has light stripes above and below its eyes. They have four toes on each of their front legs ant five on their back legs. They range in length from 8½ inches to 11¾ inches. They live predominately in open deciduous forests and at the edges of woodlands. 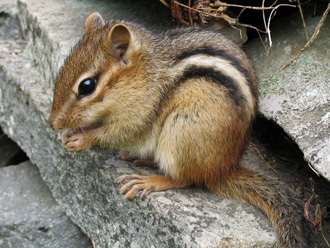 The Eastern Chipmunk can also be found in bushy areas and in rocky areas such as walls near houses and other buildings throughout the region. They construct underground burrows in which to live, which comprise either single tunnels, or extensive tunnel systems, usually with several entrances. The burrows are up to ten feet long and less than three feet deep. They may include enlarged cavities for nests (made of pieces of leaves) and food caches, which are often large enough to last into the following spring and summer. 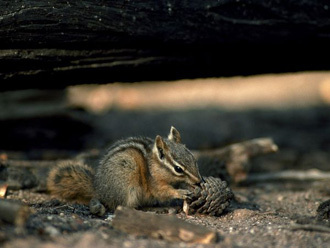 Most of the Eastern Chipmunk’s diet is made up of nuts, acorns, seeds, mushrooms, fruits, berries and corn. It also eats insects, bird eggs, snails and occasionally small mammals like young mice. Despite being essentially a ground animal, they will climb large oak trees when acorns are ripe, and will also scale Corylus bushes to harvest hazelnuts. 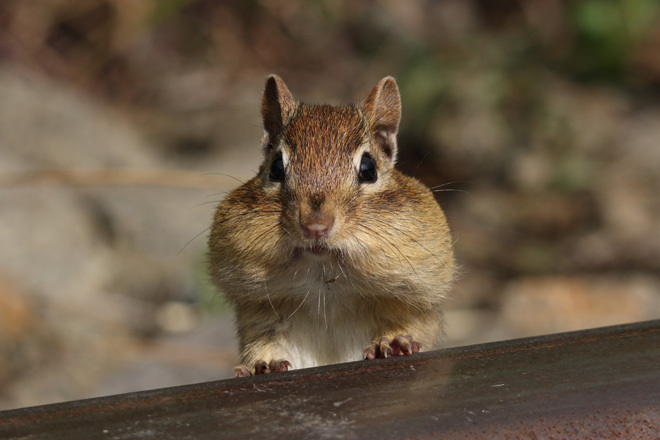 Like other chipmunks it has pouched cheeks that it uses to store and carry food. The Eastern Chipmunk spends a large part of its waking hours gathering and storing food for the winter months. They are very vocal and can be heard chattering as they gather food, and it is this chirping noise that gave chipmunks their name. From late fall to early spring, they stay in their burrows. The Eastern Chipmunk doesn’t truly hibernate, instead entering torpor, where it spends a lot of time sleeping. It will wake every few weeks to eat the food it has stored. Individuals may occasionally appear above ground during winter, especially in mild weather. They defend their burrows and live solitary lives, except during mating. Females produce one or two litters of four to five young. They have two breeding seasons from February to April, and June to August. The young will come above ground when they are roughly six weeks old. The Long-tailed Weasel is the Eastern Chipmunk’s major predator, but hawks, foxes, Bobcats, and house cats prey on them also. The expected lifespan of the Eastern Chipmunk is on average two to three years in the wild, and up to eight years in captivity.